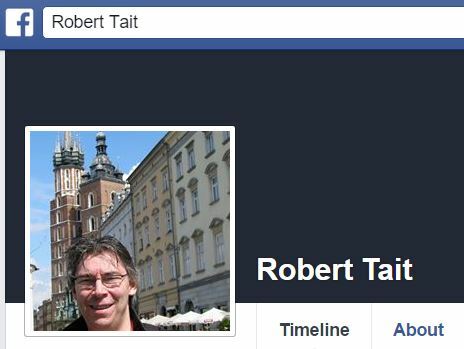 UK Media Watch has reviewed a series of Facebook status updates by The Telegraph’s Middle East correspondent Robert Tait, which reveal a radical worldview more in line with the agitprop of Electronic Intifada bloggers than a journalist for a serious British newspaper. Here are a few examples of status updates from the Jerusalem-based journalist, some of which seem to suggest that he accepts the radical anti-Israel caricature of an immutably racist Jewish state drifting towards fascism. 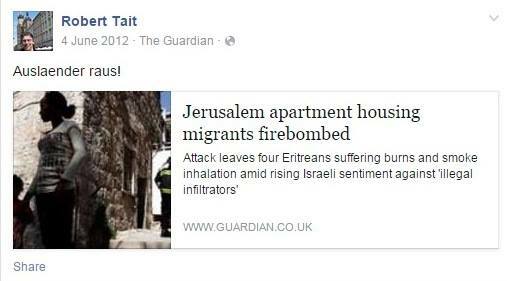 In the below post, Tait curiously uses the German phrase “Auslaender raus!” (“foreigners out”) – possibly meant to evoke the anti-foreigner (and anti-Muslim) rhetoric of German extremists – in the context of posting an article about the firebombing of a migrant’s apartment in Jerusalem. 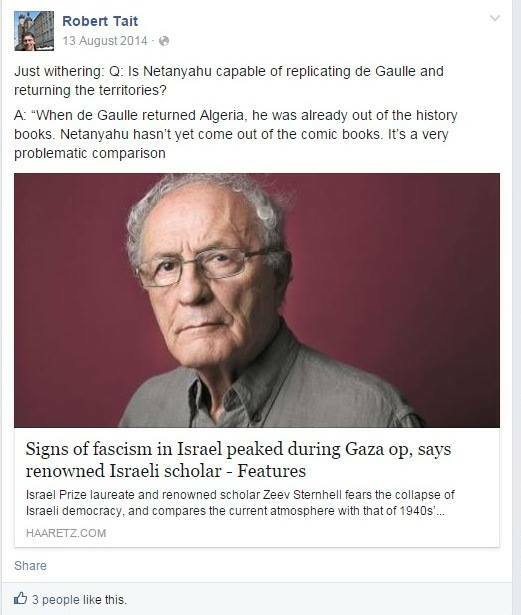 He also approvingly posted a Haaretz article by Zeev Sternthal during last summer’s Gaza war, arguing that Israel was moving towards fascism. Sternthal is an extreme-left academic who argued, during the Second Intifada, that Palestinians have the right to commit acts of violence against settlers. 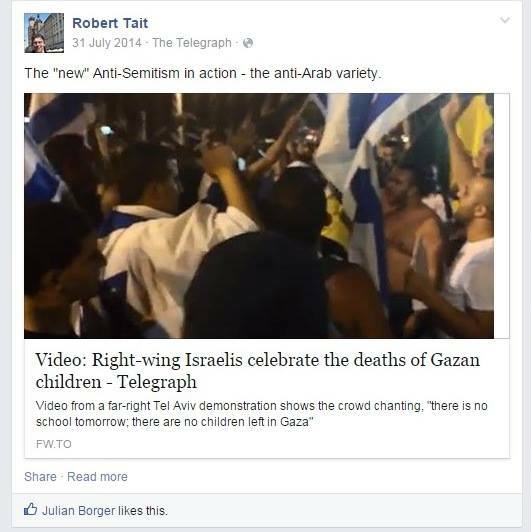 Below, Tait approvingly posts an appallingly misleading Guardian article suggesting that Israelis were ‘cheering’ the killing of Gazan civilians during last summer’s war. 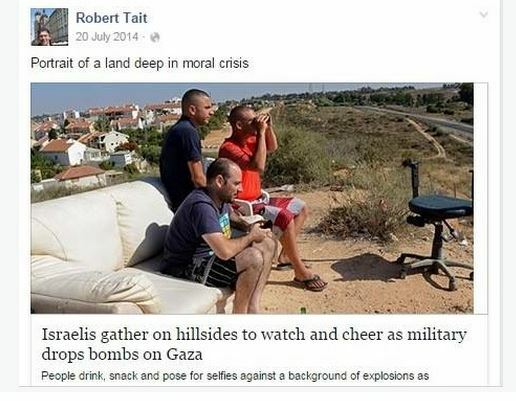 In this status update, Tait posts two articles by extremist Gideon Levy (of Haaretz), one claiming that Israel’s real purpose in the Gaza war last summer was simply “to kill Arabs,” and the other suggesting that the state is drifting towards Soviet-style totalitarianism. 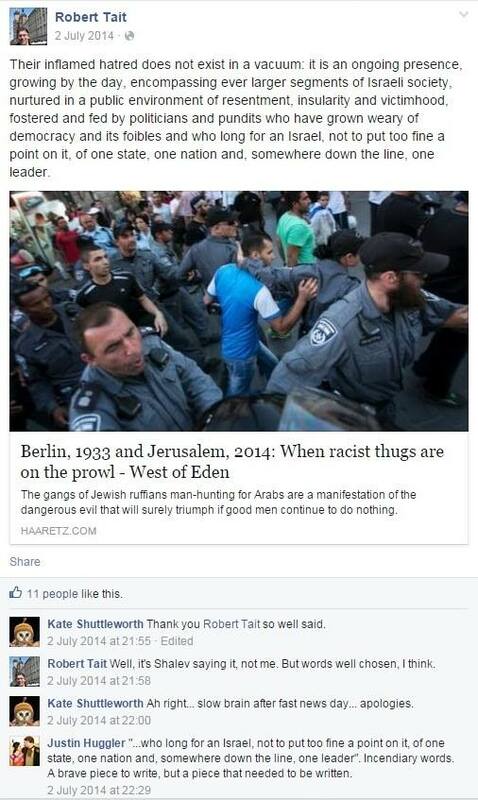 Last July, Tait posted a Haaretz article advancing the Israel-Nazi analogy. 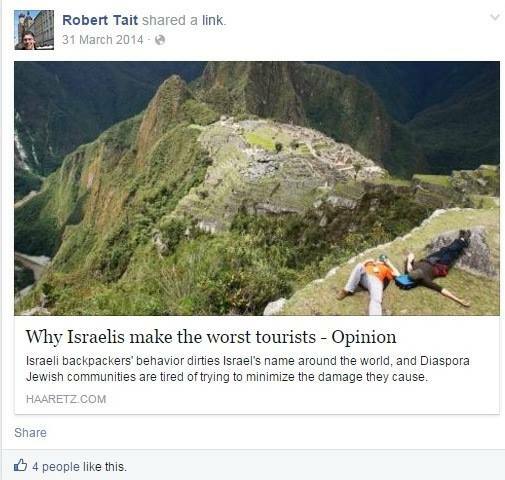 In this post, Tait mocks the “new antisemitism” – a term generally meant to characterize the hatred of Jews that hides behind ‘mere’ hatred of the Jewish state. 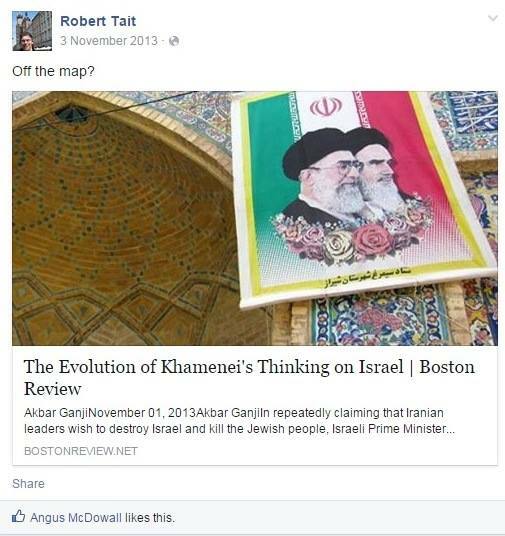 Here Tait posts an article suggesting that “claims” that Iranian leaders want to destroy Israel and kill Jews are not true. Rather, the author of the article concludes that Iran merely supports the Palestinians. 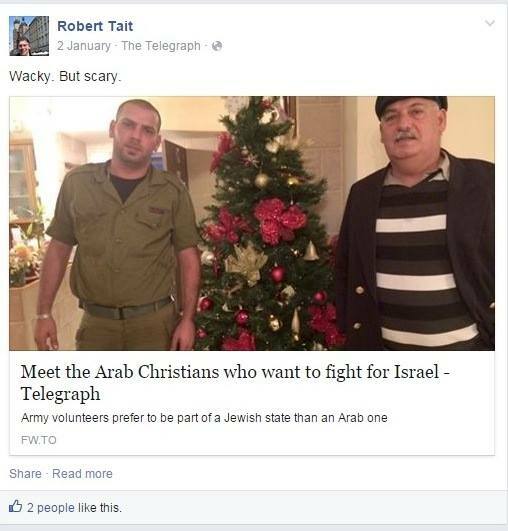 Here Tait posts an article he wrote at The Telegraph, and characterizes as “scary” the notion that Christian Arabs want to fight for Israel. 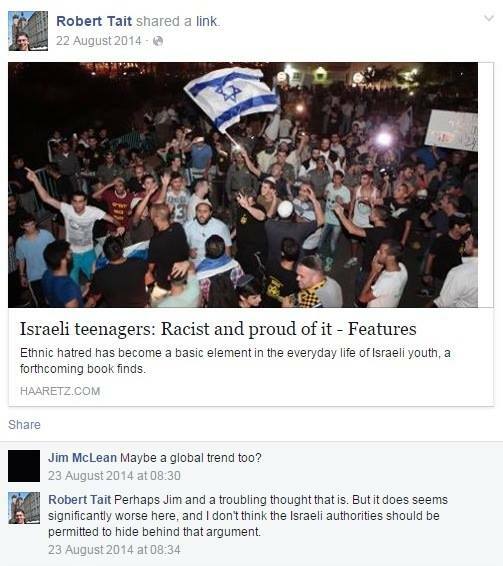 Whilst most British journalists covering Israel are clearly biased against the country, Tait seems to go beyond mere bias (and pro-Palestinian advocacy) by accepting some of the more crude and bigoted stereotypes of the Jewish State. Further, it’s remarkable that he clearly doesn’t feel any need to hide his views. At the very least, Tait’s animosity towards one of the parties in a decades-long conflict he’s covering raises serious questions about how Telegraph editors can expect him to uphold basic journalistic values such as fairness, professionalism, and objectivity.